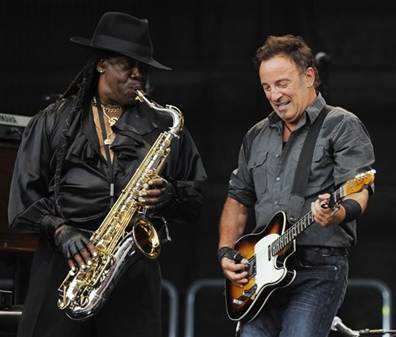 The 'Born to Run' hitmaker was devastated by the passing of E Street Band member Clarence Clemons in June 2011 but feels "lucky" that the musician was able to play on a track on his new album 'Wrecking ball'. Bruce said: "I met Clarence when I was 22, my son's age, still a child really. "Something happened when we got close, it fired my imagination. "So losing Clarence was like something elemental, the air or the rain. There's just something missing. "We were lucky to get him on 'The Land of Hope and Dreams'. When the sax solo comes up, it's a lovely moment to me." Bruce writes from his own experiences but hopes his fans are still able to relate to his songs. He added: "My work has always been about judging the distance between the American reality and the American Dream. "I write to process my own experiences and if I can do that for me, I hope I can do that for you."